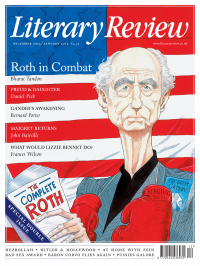 On the surface, it might seem an odd decision for a critic to cleave faithfully to the grain of Philip Roth’s life and works, since so much of both has been defined by conflict, if not downright contrarianism. After all, Roth’s career can be traced as a relief map of oppositions, from the outraged reactions to his 1959 New Yorker story ‘Defender of the Faith’, famously reworked in The Ghost Writer (1979) as Judge Wapter’s ‘TEN QUESTIONS FOR NATHAN ZUCKERMAN’ (‘Can you honestly say that there is anything in your short story that would not warm the heart of a Julius Streicher or a Joseph Goebbels?’), to his ongoing struggles, over the years, with various misconstructions of his work and with that ‘anti-Roth reader’ which he once conjured for Hermione Lee (‘I think, “How he is going to hate this!” That can be just the encouragement I need’). Likewise, given the running concern in Roth’s post-1960s novels with fractured and invented identities and the alternative trajectories of ‘counterlives’, is his not a story that might more naturally be served by a fragmented, non-linear treatment, after the fashion of Jonathan Coe’s exemplary biography of B S Johnson, Like a Fiery Elephant, or at least the kind of metafictional meditation that Roth himself offered in The Facts? In this light, Claudia Roth Pierpont’s defiantly linear Roth Unbound could have come over as damagingly counterintuitive, like writing a biography of Borges in the style of John Forster’s life of Dickens. It is to her credit, then, that much of it offers instead a demonstration of the quieter virtues of her more traditional approach – even if it results in a few significant omissions along the way. Any biographical study of Roth is always going to have to take on board some tricky (if aesthetically fertile) circumstances. The life of writing and the lives of writers have often been major elements in Roth’s novels, but ones that take on deliberately confusing fictional lives of their own – for instance, Nathan Zuckerman begins life as a fictional creation of Peter Tarnopol in My Life as a Man (1974), only to resurface as an author in his own right in many subsequent novels. Over and above that, though, is the biographical legend of Roth himself, on which his novels both do and don’t draw. A cynical and/or cloth-eared reader of Roth might well take his story as the great template for the modern-author-as-celebrity (though this itself looks increasingly as if it may prove to be a blip in literary history, since writerly celebrity presupposes the existence of people who read). The Newark childhood in the 1930s and 1940s, which animates both Roth’s first book of fiction, Goodbye, Columbus (1959), and his last, Nemesis (2010); the rise to public fame and notoriety following the publication of Portnoy’s Complaint in 1969; the high-profile romances with Claire Bloom: these already feel like parts of the mythology of late-20th-century literary life, perhaps because so much of Roth’s career overlaps with a time when literary novelists were people whose names were known, and whose books were (at least) bought. At the same time, though, Roth’s writing has played a bloody-minded, if aesthetically justified, game around the borderline between life and art: translating what might appear to be recognisable elements of autobiography into the parallel dimensions of imaginative fiction, insisting on the prerogative of fiction to be something other than the simple product of its original ingredients and sources, a synthesis that can’t simply be broken back down into its constituent elements. While Pierpont’s is obviously a sympathetic account of Roth’s work, it isn’t, fortunately, a sycophantic one – certain novels and phases of the fiction come in for some especially searching criticism, notably the post-Portnoy comedies of the early 1970s. There are some areas, however, in which her approach doesn’t convince quite so much. Her personal and idiomatic familiarity with Roth and his social milieu results in the odd phrase that might be more at home in something like Hello! (‘The spartan cabin is based on Roth’s writing studio, which stands just a couple of hundred feet from his beautiful, spacious house’). More problematically, the imperative to cover the whole oeuvre with something like a fair distribution of attention means that certain points are raised tantalisingly but then not explored as fully as they might be. The example of F Scott Fitzgerald first crops up in Pierpont’s early discussion of Goodbye, Columbus, and his imaginative presence in Roth is something to which she returns when discussing the later Zuckerman sequence. She rightly notes ‘the faint echo … of the end of Gatsby’ in Zuckerman’s description of Coleman Silk in The Human Stain, leaving his family ‘in order to live within a sphere commensurate with his sense of scale’. But Fitzgerald’s footprints are visible repeatedly in these novels – after all, The Human Stain restages a version of Gatz’s funeral just as deliberately as the later Exit Ghost reworks James’s The Aspern Papers – and it would have been fascinating to have heard more on these echoes, not least because they chime with an imaginative concern that has run throughout Roth’s work, from beginning to (apparent) end.